About Janice Graham-Welsh and 40 Plus Fitness. Janice is a retired Registered Nurse with over 35 years’ experience in emergency medicine and other medical specialties. She has twice been awarded the annual Excellence in nursing award from the University of California Davis Medical Center, and is a regular speaker on topics like health and fitness. 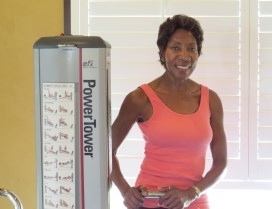 She has been a fitness enthusiast for over 35 years and attained national training certifications from American Council on Exercise, American Institute of Fitness Educators Older Adult Training, Medical Exercise Specialist, and MELT, a self- treatment plan to help clients stay pain free. Janice has also worked with the University of Washington and California State University, Sacramento researching the improvement of strength balance and endurance in senior exercise programs. As a marathon enthusiast, Janice has successfully coached 3 marathon-training programs for adults. In 1999, she founded the 40 Plus Fitness Company, which specializes in working with older adults, and those with medical conditions such as diabetes, hypertension, arthritis and heart disease. Currently, Janice works with men and women ranging in age from 40 to 90 years old and enjoys teaching and sharing a lifestyle filled with energy and challenge. We offer privacy in our home fitness center.